Last night, we saw some info about what specs to expect from the upcoming LG G Watch, and now we also have some more info on the potential release date for the device. We have long expected that the G Watch would be announced properly during Google I/O at the end of June, and that it would likely be something of a developer reference device. Now, we're hearing some more rumors in that same vein that sound pretty reasonable. The first is that the G Watch will more than likely be part of the freebies that Google gives to I/O attendees, which makes perfect sense given that it wants to get developers interested. Also, while the G Watch will be announced during Google I/O, it now has a rumored release date of July 7th at least in the UK. As expected, the G Watch should have a lower price tag than much of the competition, and may even be priced lower than the Samsung Gear 2 Neo. The plan appears to be that the G Watch will be announced and shown off along with the Motorola Moto 360 during I/O, and released soon after. But, the rumors are also now saying that there will be a new manufacturer showing off an Android Wear device during I/O. No one is sure yet who it will be, but early suggestions are pointing to Asus. 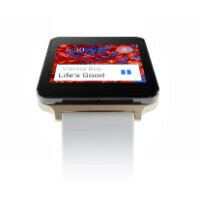 "LG G Watch may go on sale July 7th, will likely be free for Google I/O attendees" Lucky bastards. They pay to attend I/O..
Thing is they get it first. Oh, yeah... Paying $900 for the event and I hope they get something out of it. Can the Google I/o get any better? Moto 360 will be a better device for the event. I think its a perfect time for Nexus 8 and 10 to get unveiled along with android 5. There was 0 leaks concerning a new nexus 10 so it's very unlikely to see it in the i/o event. I also doubt that there will be a nexus 8. They may tease it but is not coming anytime soon. They just pushed 4.4.3. Next version will take some time. So? 4.4 was released in the same month as 4.3.1. Minor updates (0.0.x) have no effect on major releases (0.x and x.0). They're quick and easy to develop because they're just bug fixes, so they just work on them alongside major releases as a side project. I'm not a big fan of this first generation of smartwatches, but it would be nice to be able to get one that runs AndroidWear for a reasonable price so I could check out app development. The apps I've seen for smartwatches so far are pretty lame. Samsung might be saving on battery life going with Tizen, but they are going to take a hit on app development. It'll be interesting to see how things play out. Maybe Samsung will never open up their smartwatches as a developer platform, so it won't matter. Don't know about you but i am never buying a smartwatch with 1 day autonomy. I like the eink concept (always on, close to 0 power drain)..like the pebble. I need my smartwatch so i get notifications, maybe control music play and a few options...and the time/date/calendar events.